Finance, investing, cash flow… these are fundamental elements of business that every MBA student will be expected to master at some point in their career. Every MBA program in the nation has a class or course sequence that covers all the aspects of finance that go into keeping every business, in business. So you’ll have some exposure to matters of finance no matter what MBA program you choose. But those are just the basics. The world of finance and banking is vast and complex, and if you plan to make a career in the field – and the kind of money those careers are synonymous with – then what you really want is an MBA with a concentration in finance. A finance concentration will take you deep into the arcane details of finance and banking. Programs exist that have courses in everything from investment analysis to financial psychology to detailed studies of market derivatives. With an MBA with a finance specialization hanging on your wall, you can shoot for positions as varied as hedge fund manager, investment banker, or hot shot Wall Street trader. But first you have to pick the right program. That’s where this list of top MBA programs with finance concentrations comes in. There are more than 1,000 MBA programs in the United States, and a lot of them offer finance concentrations. Not all of them give you the same quality education, though. Each of these organizations takes a hard look at programs applying for accreditation and puts them through an exhaustive evaluation process to ensure they are hitting all the points that the business community expects MBA grads to master by the time they hit the boardroom. While they leave specific curriculum decisions to the schools themselves to allow for flexibility and innovation in the educational process, they do validate the processes used to establish that curriculum, the selection and credentials of faculty, and the administrative and grading procedures that schools use to determine student eligibility and graduation. It’s a major, multi-year effort for a school to get accredited, one that involves a lot of paperwork and exhaustive on-site evaluations. After a business program has been put through the wringer like that, you can be sure it will deliver. Even after you narrow your window to just all the fully accredited programs that offer finance specializations, though, you still have a lot of schools to sift through. But no worries… we took care of that for you, selecting only the cream of the crop for this list. We went through them all, program by program, to evaluate the extra criteria that separate a good MBA from a great one. We looked at the general aspects of an MBA education first. Does the program cover all the bases that modern businesses expect in their executive job candidates? Do you get a strong education in communications, marketing, strategic analysis, and leadership skills? Does the school build confidence and decision-making abilities in MBA students? Then, we looked at the courses and faculty. Do instructors have real-world business experience to pass along? Are class sizes small enough you can expect plenty of one-on-one interaction with your professors? Does the school offer at least some online options to give you the most flexibility in how and when you can attend class? You better believe these schools offer all that and more. Finally, we dove into the specifics of the finance specialization track itself. Even as a specialty, finance is a big topic… we sussed out whether the concentration tries to give you a big-picture perspective on all the aspects of business finance, or offers sub-specializations in areas like investment banking, personal finance, or international finance. One focus or the other isn’t necessarily good or bad, but it’s definitely something you want to know when you’re picking the school, and we ensured the courses being delivered teach you what they say they’ll teach you. We also checked out, and noted, the cherries on top… the option to take an overseas business trip, for instance, or a particularly strong alumni network in the industry to help hook you up with solid job leads after graduation. Although we’re confident that every program on this list is worthy of your consideration, we know that you’re on the lookout for something special. That can be different things for different people, but whatever it is that sparks your interest, we’re sure you’ll find it here. The Collat School offers a decision-oriented degree that will bolster your ability to functional as a well-rounded leader in the field of finance. You will learn skills in web analytics, social media, real estate decision analysis, and operations and supply chain management on top of your accounting and financial courses. The finance emphasis to the Master of Business Administration degree at the University of West Alabama offers an education in advanced skills in finance. The courses include business intelligence considerations, an important aspect of all elements of corporate finance in the modern world. You’ll have an opportunity to zoom down into the psychological factors behind behavioral finance and organization decision-making as well as taking a decidedly big-picture view of international finance and capital markets. A course in non-profit financial management provides a window into an under-served type of finance study in MBA programs, which makes UWA a great choice if you plan to make an alternative career in government or not-for-profit corporations. Attend on-site classes by remotely controlled robot! Okay, we have to explain about the robot first… the hybrid Flex MBA option at the Carey School, in cooperation with the ASU information technology department, has put together three tablet-based remotely operated robots for remote students to operate in live classroom environments. Is it better than strictly online courses? No, but it sure sounds a lot cooler! Either way, ASU has you covered with one of the most highly ranked online MBA programs in the country. The finance concentration is powered by a faculty that has also earned the prestigious AACSB accounting accreditation. The Carey School’s motto is “Where business is personal,” though, and despite their number skills, graduates are known for the soft skills that make them genuinely valuable in real-world problem solving exercises. Otherwise, companies might as well just hire the robots! Ashford University has long been a leader in distance education, so it’s no surprise that its fully online MBA in Finance program stands out from the crowd. With a focus on financial planning, analysis, and strategy, the MBA in Finance is the specialized MBA you’ve been looking for—and the online delivery you need. With focused on courses like Financial Investment Management, and Corporate Managerial Finance alongside a robust MBA core, you’ll be prepared to assume management and leadership roles and sit for the CFA exam. Choose this program and you’ll benefit from the esteemed faculty with real-world experience…a student-faculty ratio of just 13:1…the convenience of six-week courses, taken one at a time…24/7 technical support…and access to the Ashford team of Career Specialists, who are there to provide you with customized career planning, one-on-one coaching, and more! CalSouthern offers a practical and useful course of study that seeks to instill the basics of communication, critical thinking, information literacy, and logical reasoning skills in all MBA students. The university recognizes that these are life skills as much as business skills and focuses on the big picture in building future executives and leaders. In the financial management concentration, you’ll have the opportunity to build on this firm base of personal and professional skills with additional courses in consumer and corporate lending, banking and financial services management, and the mysteries of capital markets and behavioral corporate finance. The curriculum rivals that of many larger programs, at a fraction of the cost! Community-based learning curriculum promotes social justice. Like any Catholic university, NDNU fosters strong community ties. Unlike most other universities, however, that community is Silicon Valley, and neighbors include Apple, Google, Facebook, and other luminaries of technology and industry. Through the university’s commitment to community-based learning, you’ll have internship opportunities the run the gamut, from local social or environmental organizations to big business. One aspect common to all of them is a need for expert financial advice and assistance. Your training in international and behavioral financial matters through the MBA concentration will be cemented by on-the-ground experience out in the real world. You’ll learn the terminology, techniques, and analytical frameworks that will help inform investment and risk-management decisions for everything from a small community non-profit to a major multinational corporation. Redlands offers a well-respected MBA program that hits all the right marks in general business education: accounting, HR, and planning considerations taught by serious, experienced, professional faculty with real-world business experience in their backgrounds. But the finance curriculum goes the extra mile. You get the full spectrum of in-depth financial education, from a broad theoretical discussion of the markets and institutions that underpin global finance, to instruction in the nitty-gritty of investment theory and analysis. You can take your specialization in any direction with a curriculum that covers both managerial and global finance, working as an investment banker or as a corporate executive with an in-depth understanding of how the money flows. Finance is important in business, and it’s a constant issue no matter where your business is located. While New York and Chicago may see the lion’s share of financial transactions and positions in the United States, companies in Colorado have just as much a need for well-trained executives with deep financial knowledge. That’s why the UCCS MBA program has developed into one of the better financial emphasis options in the Mountain West, and unquestionably the finest in Colorado. With a strong international focus both in the general MBA curriculum and within the finance emphasis courses, you won’t feel landlocked. And with a solid core of managerial accounting, strategic management, and marketing courses, you’ll graduate from UCCS with everything you need to take on today’s challenges in the business and banking world. There’s nothing that gets employers more excited than an MBA that is hyper-specialized in their particular industry. That’s why Embry-Riddle’s MBAA program has taken off like a rocket for anyone interested in a career in aviation. As an industry with unique requirements and regulatory constraints involved with almost every aspect of operations, aviation demands graduates who are well-versed in the very specific details of the modern air manufacturing and transportation systems. The MBAA gives you exactly that preparation, emphasizing the application of modern business concepts, methods, and tools to aviation and business by weaving the intricacies of aviation into the core courses. For the finance specialization, the program goes in even deeper. The unique aspects of financial engineering that go into capitalizing airlines are explored along with common aviation industry practices like investing in hedges on fuel costs. There won’t be any other MBA graduate in the country who can compete with you on aviation-specific issues with an MBAA from Embry-Riddle on your wall. There’s a lot to like about a Miami Business School MBA… the global aspects of the school and city, the wide range of options for attendance and schedule, the superb professional support that various clubs and programs offer to students. But for students focused on a career in finance, the program takes its benefits to a whole new level with not just one but two different finance-oriented concentrations. The focus on corporate finance offers a dedicated 15-course sequence that hones in on corporate finance functions such as controller’s office, treasury management, capital budgeting, and investor relations. These highly specific courses set you up specifically for senior executive roles in major corporations, where you can put the expertise and skills you have learned to good use. Bradley University’s Foster School of Business offers a well-rounded MBA program that covers every base in modern business strategy, ethics, and innovation. The finance concentration is a 9-hour cherry on top of those broad business skills. All of them are polished up as a part of your senior consulting project, a student-led, cross-functional effort that puts your new training to use addressing the organizational needs of local business. North Park University’s comprehensive and relevant MBA, along with a Graduate Certificate in Finance, spells success for finance professionals like you with aspirations of earning the CFA designation and assuming leadership positions as finance managers, analysts, and chief financial officers. The Graduate Certificate in Finance, which is designed to be added to your MBA or pursued independently if you already hold a master’s degree, boasts a five-course curriculum that’s grounded in financial management, corporate financial strategy, structure, and policy. Just some of the areas of focus include fiduciary responsibility, investment strategies, and managing risk. Other reasons to place put North Park University at the top of your list include: a fully online, asynchronous course delivery for the best in flexibility and convenience…a student-to-faculty ratio of just 12:1…an 88% job placement rate at graduation…and outstanding student resources through the Center for Online Education. The Leighton School put some time and energy into redesigning their MBA program to fit the needs of both modern businesses and today’s students, and they hit it out of the park. The flexible hybrid format allows you to spend half your time out of the classroom, working from wherever you find it most convenient. Students with extensive professional experience can get a GMAT waiver. The new capstone project experience focuses on communication, offering students strong writing skills and a serious team building experience that will pay dividends when it comes time to lead the troops out in the real world. The Leighton MBA seeks to impart knowledge through action, putting you to work with hands-on problem-solving to develop your business skills in finance. The Princeton Review has ranked Valparaiso among the Best Business Schools 8 years running! Valparaiso’s stackable MBA program does its best to make attendance easy. The MBA LIVE remote study experience lets you work classes around real life, even if you’d planned to attend in person originally. The school also goes out of its way to ensure that you get a wealth of experiential education no matter how you come to class. Internships and the Curricular Practical Training program put you out in real-world businesses dealing with real-life problems as part of your finance program studies. The University of St. Mary is the flexible and convenient MBA in Finance you’ve been looking for! Whether on-campus, online, or a combination of the two, you’ll be prepared to assume a variety of leadership and analyst roles in finance, thanks to a well-rounded and robust curriculum that includes an MBA core and a focus on advanced financial topics, financial decisions, and capital issues. With five start dates throughout the year and year-round courses, you’ll be able to complete the online MBA in Finance in about 24 months, all the while maintaining your professional and personal responsibilities. Or, consider the One-Year MBA in Finance, an accelerated course of study that allows you to double up your course and graduate in just 12 months! The Bauernfeind College at MSU values teaching and research activities. Both of these centers require and encourage the most skilled faculty, which is great news for you: the MBA program is taught by rock stars with deep experience and academic accomplishment in their respective fields. The core curriculum of the MBA program is solid, but the finance concentration really jumps out at prospective students with a wide array of interesting elective options available. You can find specialized instruction in everything from international financial markets to portfolio management to capital investment analysis. A Bauernfeind MBA will make a great addition to you trophy wall in your Wall Street corner office… and it will help you get that office in the first place. The motto of the Smith Online MBA is “Bring it on.” That means bring on the technology; a state-of-the-art remote learning system keeps you in tight contact with professors and other students. It means bring on world-class experts; you’ll be learning from top-ranked faculty who are experienced specialists in their fields. And it means bring on fearless and inventive students, like you, who can take advantage of everything a Smith MBA offers to put together leadership, decision-making, and analytical skills to create the perfect executive presence and portfolio. With the finance career track, you’ll take all that management talent and knowledge and ice it up with commercial banking and capital market expertise that will open doors on Wall Street or at any bank or management firm in the world. Suffolk emphasizes the use of financial tools and methodologies to develop critical thinking skills in finance concentration MBA students. This approach drives advanced decision-making skills that schools with simplistic rote approaches to financial education can’t duplicate, making you a valued candidate for jobs in investment banking, risk management, or financial analysis. With more than 20 financial management and science electives to choose from in building your customized concentration curriculum, you can put together a CV that can lead into any of those industries or more. Everything from real estate to private capital markets to fixed income securities is on the table for students at Suffolk. Baker College’s MBA in Finance is all about quality, and its curriculum shows. Learn from professional finance experts…stay in the know about the latest developments, concepts, and techniques in the finance industry…improve your analytical and problem-solving skills…and dive deep with case study analyses, online labs, and other skill-building activities—all through a fully online course of study. The 36-credit MBA in Finance is perfectly designed for working professionals like you who are looking for a robust program that’ll prepare them for the CFA exam and leadership positions but also provide them with the flexible curriculum they need. As an online student, you’ll also appreciate Baker’s outstanding lineup of student services, including the Academic Resource Center, which is available online, any time of the day or night. The finance concentration at Bethel doesn’t just offer advanced finance courses in quantitative statistics and examining finance trends to help you make smarter business decisions; it also puts you through your paces by creating a mock company for you to make those decisions for, watching and adjusting the results in real-time through the course of your program. With additional class options in managerial economics, global finance, and advanced finance, you’ll get both the knowledge and skills to succeed in finance and banking after graduation. An integrative team capstone project polishes the program off to put together all the elements in a coherent way around a real-life business or leadership project. Entrance exam requirement: GRE/GMAT scores may be required for certain applicants. Belhaven’s MBA in Finance offers adult learners like you with the online delivery you require to successfully balance your professional responsibilities with earning your MBA, along with the robust curriculum needed to pursue leadership and management roles in corporate finance, investments, banking, financial services, and more. As a student of the MBA in Finance program, you’ll complete a comprehensive and robust MBA core, along with courses focused on financial markets, investments, and other contemporary issues in finance. In addition to offering a superb Christian environment that advocates high academic standards, Belhaven offers online students like you a flexible course curriculum that features manageable, eight-week terms, a dedicated faculty with real-world experience, and outstanding student resources through the Belhaven Career Network. Whether in-class or online, Bellevue University’s MBA in Finance is where you’ll go for the advanced education needed to pursue the CFA designation or land high-level management and analyst jobs in finance. In addition to a comprehensive MBA core, you’ll dive deep into contemporary and relevant issues in finance such as risk management and international finance while learning from an esteemed faculty with real-world business and industry expertise. Thanks to Bellevue’s outstanding online learning environment, you’ll always feel connected, engaged, and up to speed through online forums, videos and tutorials, 24/7 tech support, and online tutoring. Creighton University delivers when it comes to top-notch education in business finance and accounting topics. Having received both the general business AACSB accreditation and the rare accounting accreditation, you know their faculty have the expertise to put these subjects together. And with dual degrees available in finance, accounting, and investment analysis, among others, you know they have the depth of experience in these subjects to teach master’s programs in all of them. So when you want to get an MBA but focus in financial matters, Creighton is the place to be. With both the highlighted concentration in Financial Psychology & Behavioral Finance and a separate one in Personal Finance, you have enough choices to drill down specifically into your chosen topic. Delivery: On campus or hybrid. NMSU faculty are known for keeping up with current trends and techniques in the ever-changing world of business, so when they noticed an uptick in employer interest in students with a broad set of management skills centered around finance, the next step was clear: add a dedicated finance concentration to the already excellent NMSU MBA program. Available either on campus or in a hybrid format, the rigorous program requires synchronous elements that ensure you have face time with instructors who are among the best in the business. The finance option will prepare you for work in investment or corporate finance with a strong curriculum in money and capital markets. You’ll cover derivatives and securities and tie it all together with a course in advanced financial management. As you’re reading this rather long list of schools that offer MBA degrees with finance concentrations, you’ve probably started to realize they aren’t that hard to find. A finance specialization is one of the most common available. But what isn’t so common is a finance specialization that also is explicitly intended to prepare you to sit for and pass the Chartered Financial Analyst certification from the CFA Institute: the gold standard for qualifications in financial analysis. And that’s exactly what the NYIT MBA Finance (CFA Track) program does. More than just a deep education in the basis of monetary and debt instruments, more than an intensive overview of international securities and derivatives, the CFA track gives you an unparalleled window into financial statement analysis and the importance of financials in corporate decision making… all the stuff you need to know to become not only a CFA, but a high-level, respected analyst. The school leverages its New York location to give students a competitive edge in the world of business finance. St. Thomas Aquinas College’s MBA in Finance offers adult learners like you with the convenience you need and the robust curriculum you demand. Thanks to a fully online curriculum, you can pursue your MBA while continuing to meet your professional responsibilities. And thanks to interactive coursework that includes case studies, group discussions, and external projects, you’ll enjoy a well-rounded, innovative curriculum that ensures plenty of collaboration and communication. You’ll take one to two classes per nine-week sessions, and there are four sessions per year. Want to take your MBA to the next level? Consider adding an Advanced Certificate in Finance to your program of study. A Finance certificate features five, upper-level courses that provide you with an even more in-depth study of finance. Although we picked the financial institutions and commercial banking concentration as the winner at the UNC Charlotte MBA program, in fact you won’t go wrong selecting any of the four finance-related concentrations at the school. With an AACSB Accounting accreditation on top of the general AACSB accreditation, you know that the finance and accounting courses at the school are among the finest in the world. When you put together that deep knowledge base with the critical thinking and leadership skills that the hybrid MBA program offers as part of its core curriculum, you get a future business executive with the acumen and attitude to step into any investment or commercial bank in the country and start doing productive, innovative work on day one. That’s exactly the kind of candidate that those banks want to see, and the UNC Charlotte MBA on your resume will get your foot in the door. Ten-day study abroad options available around the world in locations such as Chile, Spain, Italy, and Portugal. Campbell’s MBA with a financial services concentration is characterized by great in-depth courses that dive in the big-picture aspects of financial management: management of financial institutions, investment analysis, advanced income taxation, and risk management courses are all available and offer more than just a superficial view on the financial services industry. The program also broadens your horizons, offering expansive opportunities to study abroad and to work with active businesses on genuine problems that will put your skills to the test. The combination of executive-level education on financial matters with the practical, innovative core MBA courses will give you an education with real-world applicability that you can start applying day one after graduation. Study abroad opportunities in Europe and Canada available. Pfeiffer’s MBA program emphasizes the transformation of students into effective leaders through professional training and personalized guidance in the basic tenets of modern business. Those leadership skills are nowhere more important than in the field of financial fraud investigation. Knowledge of the law and ethics are worth little without the moral fortitude and confidence that a professional executive must rely on when dealing with potential criminal action. The finance-focused concentration will give you a complete understanding of financial law and the internal accounting controls and corporate governance practices that ensure that law is applied comprehensively. You’ll learn how to design those controls and systems in addition to ways to investigate their use and abuse. A seminar on contemporary issues in forensic accounting theory ensure that you will graduate with the latest perspectives on financial fraud and enforcement. Oklahoma Wesleyan University’s MBA in Finance is convenience epitomized. This flexible and accessible program is part of the university’s Adult MBA programs, which are specifically designed to accommodate working professionals like you. Whether on-campus or online, you’ll take just one course at a time, so returning to school to earn your MBA while handling your professional responsibilities is a manageable endeavor! As an online student here, you’ll have close contact with academic advisors, who are there to guide you through the process, and you’ll enjoy a fully asynchronous online delivery, which means you’ll never need to worry about logging into classes at set times. And there’s no surprises here! Upon enrollment, your tuition cost will be locked in, so you’ll never need to worry about rising tuition rates during the course of the program. 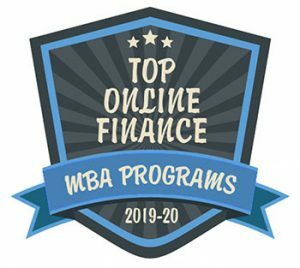 Waynesburg University’s 36-credit MBA in Finance is a fully online course of study that offers everything adult learners like you are looking for—a robust curriculum, a fully online course of study, and plenty of support along the way. This program allows you to be in control of the pace of the program. Take just one class each term and you’ll be able to finish your degree in just two years! Through the intensive, hands-on curriculum of the MBA in Finance, you’ll engage in in-depth study in areas like accounting concepts, risk analysis of investments, and international financial theories as you prepare to land managerial and leadership roles in management and analysis. Want to add a global dimension to your MBA in Finance degree? Consider pursuing one of the many study abroad opportunities available through Waynesburg. Just some of the international experiences here are located in Australia, Costa Rica, Jordan, and England! Marywood University is committed to producing graduates who are committed to making a positive impact on society at the both the regional and global levels. It’s telling that the department that runs the MBA program is the School of Business and Global Innovation… Marywood takes international exposure seriously in all aspects of education. For the Finance and Investment concentration of the school’s MBA program, this manifests as an education in both national and international markets. You’ll learn about elements of corporate planning and treasury functions as well as investment banking and international financial planning. You’ll graduate with a strong command of the financial tools and techniques commonly used in investment analysis in both domestic and overseas operations. The University of South Carolina MBA program sends students off to some of the largest regional employers in healthcare, finance, and manufacturing, and receives in return a great deal of experience and feedback from those industries. That’s great news for any student choosing a finance specialization through the program, where real-world business issues can rapidly alter the nature of the profession. The school’s rare and prestigious AACSB accounting accreditation also lends the finance specialization some additional qualification in teaching core skills in finance and accounting. You’ll get first-rate instruction in financial modeling, valuation, mergers and acquisition, and investment management topics. All of it comes on top of a solid core MBA program that gives you all the management and strategic tools to succeed in the finance industry. No business running today is immune from the effects of global trade and finance. Financial markets are interconnected as never before. This offers companies both new opportunities and new risks, and they’re looking for executive-level candidates who understand and can manage all the complex elements involved. That’s exactly the sort of job an International Banking and Finance MBA from Texas A&M International prepares you for. While you can get a finance specialization at almost any MBA program, Texas A&M International is one of the few that dives right into the global angle of finance by offering courses in international investment and financing. You’ll come out with a solid understanding of interest rate mechanics, international regulatory environments, and the ethical complexities of multicultural trading and business. There’s no better preparation for business in the modern world and no employer is going to put a resume with a Texas A&M International degree listed at the bottom of the pile. Executive MBAs are always a little more focused and a little more advanced than a typical MBA program. Aimed at working professionals who are already relatively advanced in their career, they get all the unnecessary trimmings out of the way so you can focus on the practical aspects of business knowledge to reach the highest levels of executive leadership. At TSU, the focus is narrowed even further into elements of business finance that fall right in line with a very traditionally Texan industry that is nonetheless becoming even more important for the future: energy. Although oil is the Texas staple energy product, the region is also lush with sunshine, and solar and other cutting edge projects demand experienced and educated executives to shepherd them to fruition. Energy financing, valuation, and energy trading are all skills that are needed in these positions, and they are exactly what you’ll learn in the TSU MBA program. UTA’s finance concentration is bolstered not just by the rare and prestigious AACSB accounting accreditation the business school holds, but also by the dual degree option in quantitative finance offered by the college. You’ll find yourself rubbing shoulders with students and professors in that unique program, while you pick up both the special magic of investments, international finance, and financial institutions that comes with the specialization but also the more general knowledge of marketing, strategic management, and leadership that comes with every UTA MBA. A flexible and broad variety of course formats helps almost any student find a match for this program. Dive right into management of financial institutions or futures and options trading with the MBA with finance emphasis at UTPB. You’re in oil country when you’re studying with UTPB, so you can expect to come out with a good understand of the difference between Brent and West Texas Crude, the underlying assets, and the arbitrage opportunities that exist. The oil business isn’t the only business you’ll be qualified for, however; courses in law, analytics, research, and marketing will give you the intellectual equipment to take your financial knowledge and apply it in just about any industry. The Division of Finance and Economics at Marshall has put together a specialty concentration in finance that gives you a rigorous beginning-to-end course of instruction in the intricacies of modern finance and financial management. Built on a core of solid business courses in accounting, MIS, communication, and organizational behavior, you’ll also focus your learning experience on the more esoteric details of financial markets. By the time you graduate, you’ll have an expert command of one of the most important matters for modern business to understand and some of the best job prospects open to any MBA graduates in the country. West Virginia is coal country going way back, and that gives WVU and the highly respected Bureau of Business and Economic Research based there quite a high degree of expertise in energy law and financial matters. If you have a goal of getting into the ins and outs of energy finance through a highly flexible, expert MBA program, then WVU may be the right answer for you. With a successful hybrid format that offers both flexibility and rigid academic standards, you get the freedom to pursue your own life and goals while still getting a first-rate education. In the energy finance area of emphasis, that includes matters such as energy law and regulation, financial accounting, and risk management… each of them specifically investigated from the unique perspective of the global energy markets.